Here at La Colombe, we continue to take coffee to the next level. Sometimes to do that, you have to rethink your approach, and tear it all apart. With our new Draft Latte, we rebuilt the iced latte from the ground up: no heat, no water vapors, just a silky, beautiful latte pouring cold from a keg. Draft Latte is our newest creation, and it’s the first of its kind: a creamy coffee-milk drink that is served on tap. It’s naturally sweet, with no sugar-added, and it pours out cold and frothy. It’s the ultimate iced latte, complete with a head of delicious microfoam. If you visit our shops with Draft Latte, you’ll probably see a second tap handle on our draft system. We’re also pouring our Pure Black cold-pressed iced coffee. 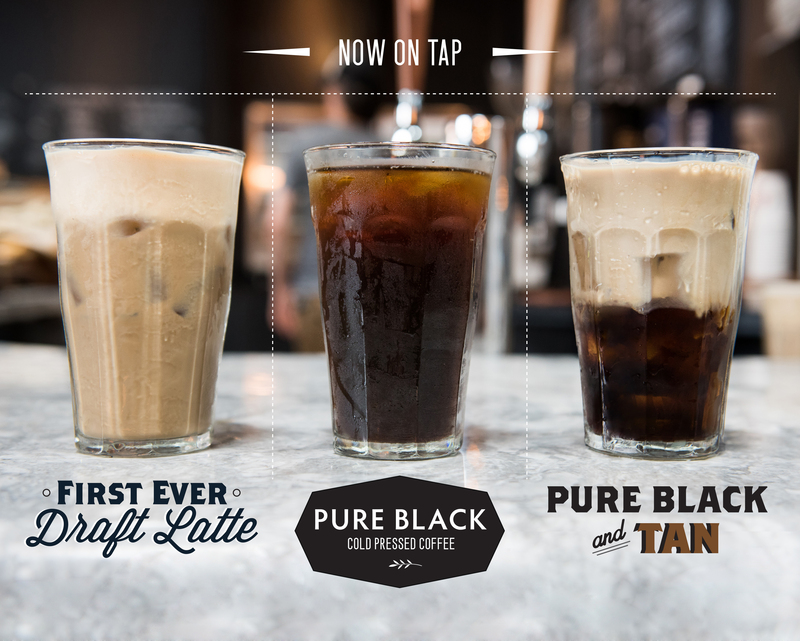 It was only natural that we would start putting the two drinks together to create the Pure Black & Tan, with cold brew on the bottom and Draft Latte floating on top. If you haven’t tried these drinks yet, you need to get on it. They’re seriously good, and they’re only at La Colombe. We need this in D.C.
What’s the word on tap in SoHo? Oops, replied in wrong place. Sorry! Hello there!!! Now we have this amazing drinks in DC, at our Blagden and our Chinatown location (6th & Ist NW), looking forward to seeing you very soon. Chinatown??? How did I miss that? I drive to church past that area every week. I’ll make sure to stop by and check it out! We need this in Jacksonville FL. You need to come to Providence where people seriously love coffee. Remember our neighbors not that far to the north threw tea into the sea. We love coffee in Rhode Island. So into this drink! Writing a little blog post about it so more people can know more! Hmmmm, How about borrowing the “widget” from Guinness and can your black coffee?!! You need to open a shop in Phoenix!! Seriously!!! With the draft Latte. any chance this will be in L.A. or at least anywhere in CA? So good- I have had the draft latte 3 times now and frankly, I’m obsessed. I have no idea how many calories are in the latte, but I am so happy it is sugar free. I could drink this every day- LOVE IT! We need you in Mile High City of Denver!!!!!!!! We need one up here in Canada! How many calories are in this drink? Do you offer this year round or only during warm months? Year round! Now serving in all of our locations. What are the nutrition stats?? Are you selling this technology to retailers? I would love to be able to sell this in my Acai Bowl store.